Marvel fans are finally getting to see what comes after infinity -- and it includes a major change to the Time Stone. Spoilers for Infinity Wars: Infinity #1 below. With the universe restored after Gamora used the Infinity Stones to fold it in half, the heroes quickly began to fight over the Infinity Stones prompting Adam Warlock to set them free and allow the stones to choose their own paths. That's where readers are left when Infinity Wars: Infinity begins, though it's not the cosmos readers are taken to. It's Texas and to the last days of a man named Hector Bautista who is awaiting execution on Death Row. The issue sets up pretty early on that the concept of time is significant here. Hector's time is running out -- we meet him literally the night before his scheduled execution, the doomed man commenting about how he thought mankind would get back to the moon in his lifetime, something clearly not going to happen now. We see him meet with his lawyer, his priest, and even his family for a final time. It's under the light of a final, not-quite-full moon that things get interesting for Hector. When Adam releases the stones to choose their own destinies -- thanks to his having the Soul Stone give the other stones "life and agency" -- they scatter to parts unknown. And the Time Stone makes its way to Earth, to Texas, to Death Row and Hector's cell. From that moment, the Time Stone exists within Hector and he quickly discovers that he has authority over time. It's something that he uses to his advantage. We learn that Hector -- at least according to him -- is an innocent man who has given up hoping the real killer will be found. But now that time is no longer running out for him since he has the ability to manipulate it, he finds freedom in another way. Hector uses the Time Stone living inside of him to escape from prison just as he is being walked to his own execution. That's right. 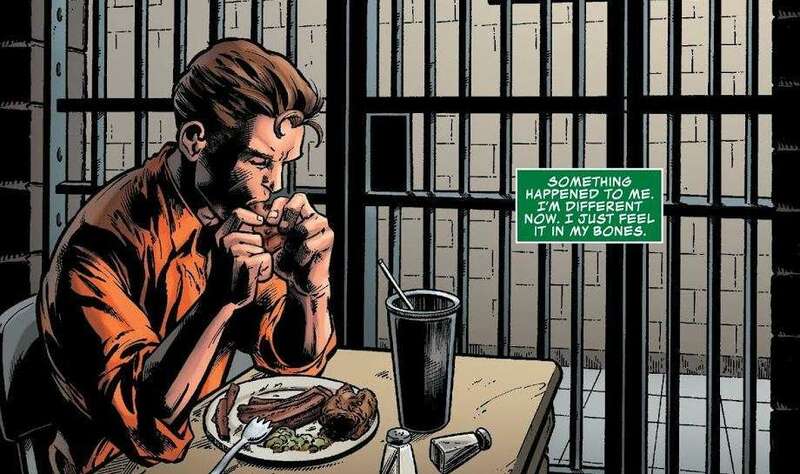 The Time Stone now lives inside a man who has just escaped from Death Row. With the Time Stone being the only stone that we've seen choose its destiny since Adam released them, it's unclear what exactly the stone's choice of Hector means. What is clear is that even dispersed as they are, the Infinity Stones are not safe. Talonar/Robbie Rider is shown watching the stones leave Earth save for the Time Stone. With this information, he notes that the Fraternity of Raptors now need to find out who wields the stones -- which means it’s likely that Hector's newfound freedom may end up being challenged by more than the State of Texas sometime soon, even if technically Infinity Wars: Infinity is meant to be the official "end" of Gerry Duggan's Infinity Wars event. What did you think about Infinity Wars: Infinity #1? Let us know in the comments below. Infinity Wars: Infinity #1 is on sale now.